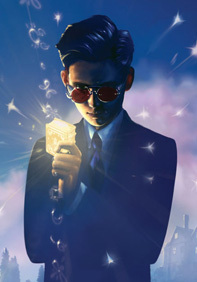 Artemis Fowl is a twelve year old boy who lived with his mother. Even at his young age, Artemis is a genius. His mother is really weak and stays in bed all day all the time. His father, however, was said to be lost over a year ago. Artemis left the news channel on and never turned it off ever since because he believed that his father was still out there.Butler is a butler who serves for Artemis. Butler’s family have been serving the Artemis family for generations, and the servant stays with the person from the family their whole life. Artemis is a criminal, just like his father. His goal was to be the first man ever to steal from fairies. He found a fairy book that contained all the ancient beliefs and laws of the fairies. His plan was to capture a fairy, hold the fairy hostage, and demand for money in return for the fairy. The fairy that was captured was named Holly, and was a high ranking officer in the fairies police department. Root, the general, tried to get Holly back, but no matter what, Artemis deceived Root every time. Root’s secret weapon was a combination of the bio-bomb inside a time field. The time field is a place that fairies can make. Inside the area, time is stopped for eight hours. You cannot naturally fall asleep if you are awake, or naturally wake up either. Root did not believe Artemis could escape, so he gave the ransom to Artemis for Holly. Artemis waited for Root to make his next move. Artemis has a trick up his sleeve, and he thinks it’s going to work. This book was not as thrilling as I thought it would be. I know that most other people have read the book and gave it good reviews, but it did not live up to its reputation. Artemis stayed the same throughout the whole book. He was evil, smart, and stayed cool. Butler, however, changed quite a bit throughout the book. At first, he put all his faith into Artemis, and never questioned or doubted him. Toward the end he was having some questionable thoughts about Artemis’s plan. Butler worried because Artemis put Butler’s little sister at risk of dying. My favorite part of the book was when the troll went to Artemis’s house and started to destroy everything.Butler then came to the rescue of the fairy and slayed the troll where he stood. This book would be good for the age group of ten to fourteen. I would rate this book a six out of ten stars. 1. How old is Artemis? 2. What color is the book Artemis borrows? 3. What is most precious to fairies? 4. What is Butler’s little sisters name? 5. What T.V. station does Artemis never turn off? 6. Where did Root go when he had a location from Holly’s locater? 6a. An abandoned ship made of lead. 7. How could Butler see the in invisible fairies? 7a. With high tech goggles. 8. What weapon did the fairies use in a time stop field? 9. How much gold does Artemis want? 10. Who can eat dirt and digest it very fast? 11. What did the fairies release to defeat Artemis? 12. How did Mulch fake his death? 12a. By strapping his heart detector on a rabbit and killing it. 13. What was the fairies advantage over humans for aeons that Artemis knew about? 13a. The bio-bomb and Time field combination. 14. Who slayed the troll? 15. How did Artemis escape the time field?